Gas station new location of Bay public library? 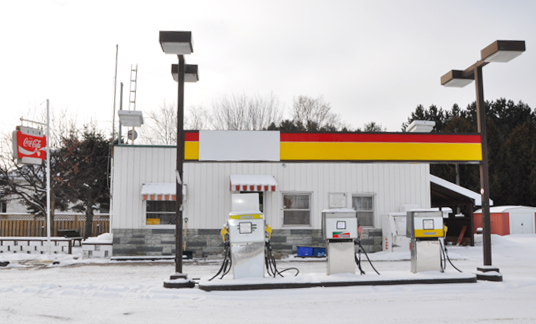 BARRY’S BAY – A former gas station located along County Road 62 now belongs to the Township of Madawaska Valley, and the community is wondering just what the township plans to use it for. The Gazette posed the question to council at the January 24 meeting. While councillors insist that the property has not been earmarked for anything, they admit that there were some projects on the back of their minds when the property was purchased. The land originally belonged to Anna Etmanski, who operated a gas station for many years. It is located behind the municipal office. Councillor Sylvie Yantha said there was a lot of discussion before the township purchased the property. But there seemed to be some confusion amongst council. But his fellow council members responded with a unanimous ‘no.’ Councillor Linda Neuman sits on the library board as a council representative. “No, we haven’t designated it, but it is a possibility,” Neuman responded. O’Reilly then suggested that the property could really be used for anything, like a future curling rink. O’Reilly then asked if the township would be willing to sell the piece of property to a business like Tim Horton’s. Neuman said the board has been asking about the property, but it is continuing to investigate its options. O’Reilly said if the library wants the land, members should send a letter to council addressing their wishes for the township. The conversation eventually shifted to what the library board is doing to plan for a new facility. Last year, Councillor Neuman announced on behalf of the board that the library is looking to relocate. The current facility does not meet accessible laws and renovating the existing building – which is already bursting at its seams – will prove too costly. Moving seems the only option.